If you’re ready for a new challenge, consider giving dog agility a try. 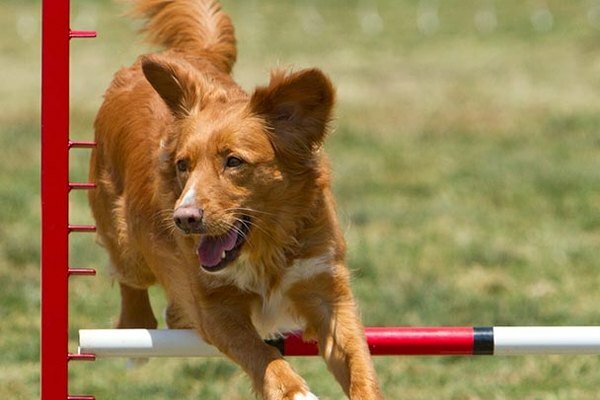 Although the training for agility requires time and patience, the sport offers obedience, social skills, and fitness benefits for dogs and is enjoyable for people as well. Sara Woolverton, handler of 5-year-old Scout (pictured), has been competing for two and a half years and says the commitment is well worth the benefits. “Scout and I both love it. You can tell from her face she has a good time.” To get involved, start with a basic understanding of dog agility and a positive attitude. 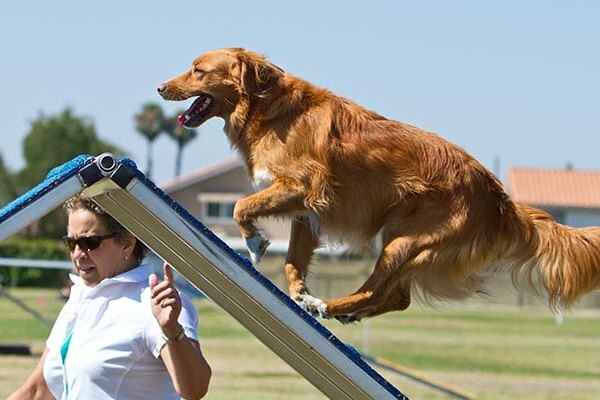 Dog agility is a sport in which dogs navigate their way through a variety of obstacles led by their handlers’ directions. “The dog knows everything he needs to know within the first one to two years,” Woolverton says. “After that, it’s all about the person. The art of it is in the person communicating to the dog what it is he needs to do.” Since agility competitions prohibit food or toy incentives, dogs rely only on their handlers’ vocal and motion cues to direct them through obstacle courses. 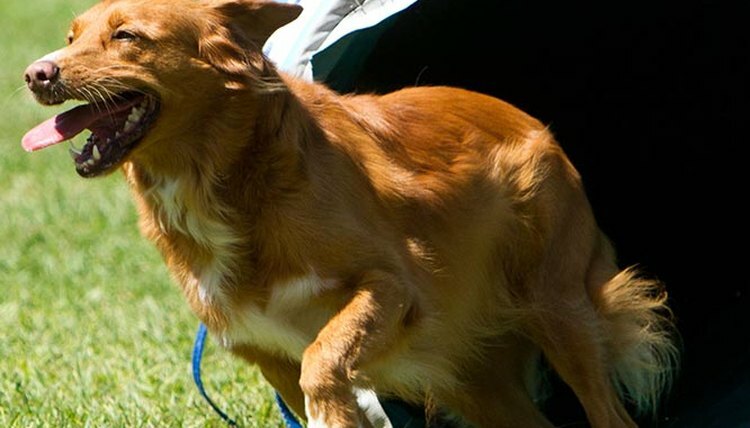 Agility training cultivates a strong bond between handlers and dogs, since dogs must follow their handlers' instructions carefully through courses. But the physical aspect of the sport is also a positive reason to participate. Training for obstacle courses is a great way to keep dogs physically fit. Agility also offers an opportunity for both owners and dogs to spend more time outside. Agility can also improve dogs’ social skills since both competitions and training classes facilitate friendships. 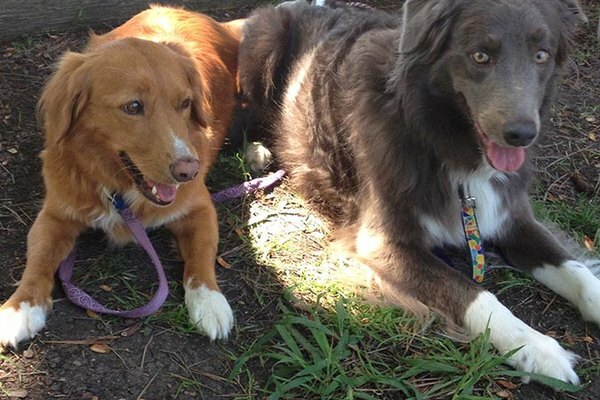 Woolverton says that Scout and her friend Sophie, a blue border collie, met in class a year ago and are now inseparable. Woolverton has also seen a change in Scout’s personality since she began agility. “She’s always been on the shy side,” says Woolverton. “She’s a retriever who doesn’t like to retrieve. But doing agility has made her more active and approachable.” Agility allows dogs to gain confidence, which will make them more comfortable in social settings. If agility sounds like the sport for you and your dog, it’s time to get started. First, Woolverton suggests that dogs complete a basic obedience class. After you have built a relationship with your dog in obedience class, enroll in agility classes. But Woolverton warns that agility classes can fill up fast. “It can take a while. But if you find one you want, it’s worth waiting for,” she says. 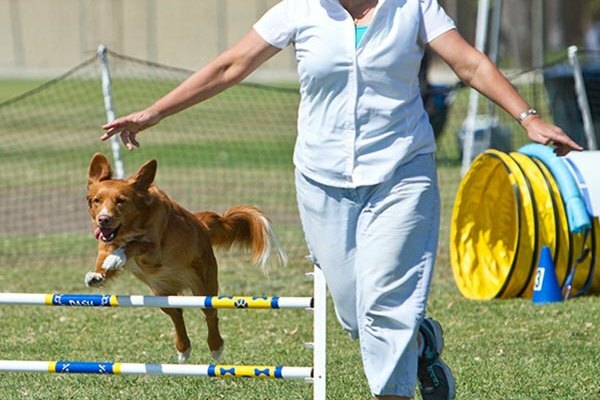 Plan ahead by joining the waiting list for agility while completing the obedience class. In agility classes, dogs will learn a variety of tricks that they can perform in competitions. 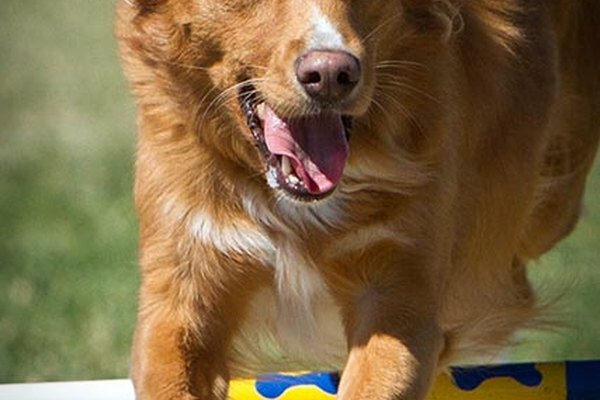 Jumps are one of the basic obstacles dogs will learn in agility classes. The height of the bar depends on the dog’s ability and size. Learning jumps is a gradual process, according to Woolverton. Dogs will start by simply walking over a pole lying flat on the ground, and handlers will raise the pole height gradually, making sure the dog is comfortable at each height before moving up. Although dogs may be persuaded with treats or toys in training, handlers will be disqualified for using any incentives during course runs in competitions. Dogs also learn tunnels in agility class. 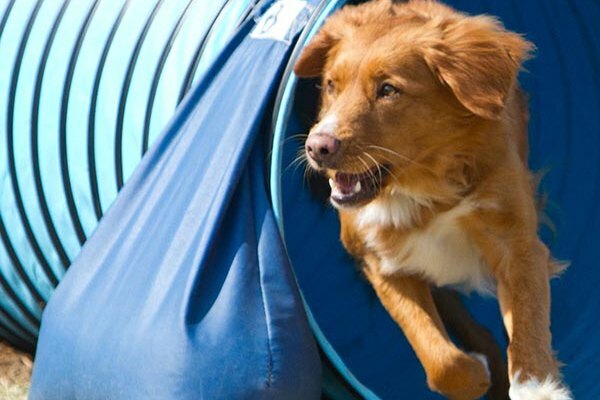 Similar to the way they learn jumps, dogs will learn how to master tunnels by slowly increasing the difficulty. Dogs first learn how to walk through a hula hoop, then a foot-long tunnel, and eventually the large ones used in competitions. Tunnels are Scout’s favorite obstacle. “Even if it’s not where she is supposed to go, if it’s right ahead or nearby, she will go through it anyway because she enjoys them so much,” Woolverton says. 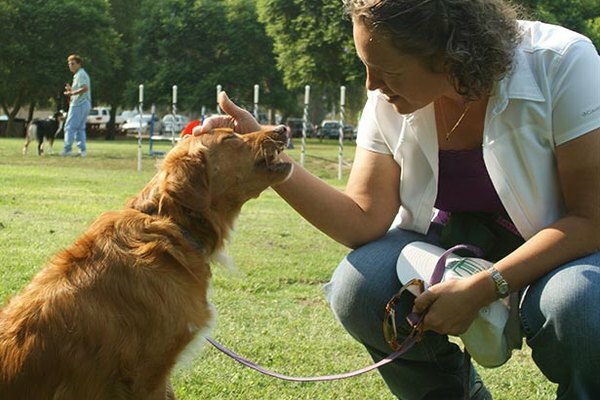 After your dog has mastered training and you feel comfortable directing her through obstacles, it’s time to sign up for your first competition. During competitions, dogs are judged on speed, accuracy and ability. Competitions are held all day for multiple days. Woolverton warns that during warmer months the events are hot and tiring for both handler and dog. 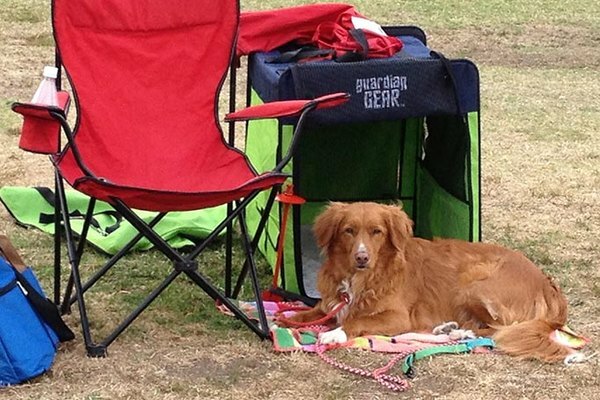 She suggests purchasing a shaded carrier and keeping water bottles close for both human and dog hydration. 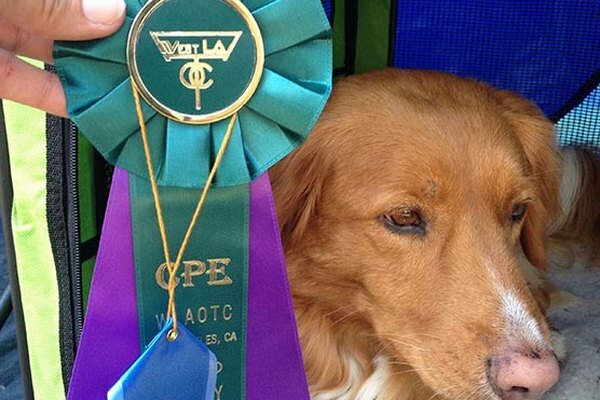 With continuous improvement, your dog can qualify for the advanced level at competitions. Woolverton says that handlers should be aware of tricky obstacle sequences at this level. “For instance, they will put something out that looks really attractive to the dog, like a tunnel,” says Woolverton. “But the handler has to get the dog to go in a different direction and take something else.” To prepare for higher level courses, handlers should devote practice time to improving their directions and train dogs to run obstacles in a complicated order. Sonja Bistranin is completing her Bachelor of Arts in communication studies at Loyola Marymount University. She has experience in social media management, public relations and marketing. A native of Colorado, she traded the Rocky Mountains for the West Coast shoreline and is based in Los Angeles.